Use this procedure to send a CEM request to one or more partners. In the user interface, launch the certificate wizard within a community to generate a self-signed certificate, or import a CA certificate. See Add a certificate. On the View certificate details page in the certificate wizard, select the use for the certificate (signing, encryption, SSL). Select Send certificate exchange messages to partners. If a the request is a CEM request, select the Respond by date and the partners to send the request. See the View certificate details page for CEM requests below. Go to step 6. To generate the request, click Finish to complete the process of generating or importing the certificate. This action also sends the request to the selected partners. 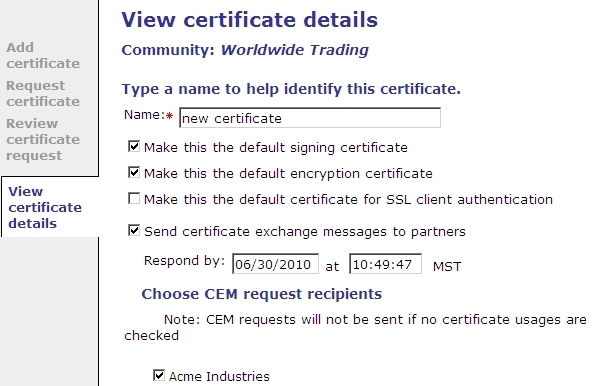 Open the Sent certificate exchange trust requests page to view the status of CEM requests. See Sent certificate exchange trust requests page.